This delightful bird was brought to western attention in 1782 by the Scottish naturalist Robert Kerr. 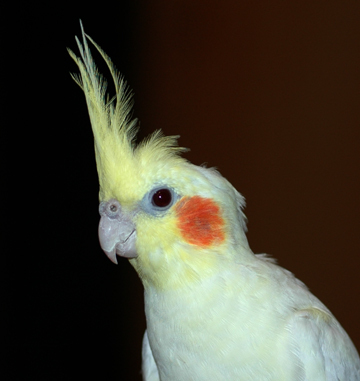 Cockatiels originated in remote areas of Australia, where export has been banned for over a century. Nevertheless, these tiny, crested cockatoos have charmed humans worldwide into making them Americas favorite pet bird. What is responsible for this phenomenal success? Any cockatiel owner will sum it up in one word -- intelligence. Like all the parrot family, the Cockatiel has the adaptability and social skills to make it one of the most beloved of household animals. Playful and curious, these birds quickly seduce their owners with their feathered crest, which communicates surprise, interest or anger. Hand-trained birds show devotion and affection for their owners, and are happy to ride around on a human shoulder all day. Ladies -- watch out! Cockatiels are fascinated by glittery earrings, and clever enough to remove them! Daisy, the bird shown above, is about 10 years old -- half-way through her lifetime. She lives in a large cage with about 10 other cockatiels and two nest-boxes. Generally at least one pair is sitting on eggs. Watching the antics of these flocking birds as they scheme to seize or defend the nest box is an education in Machiavellian strategy . Cockatiels typically mate for life, but exhibit complex behavior that defies stereotypes. All birds take an interest in the eggs and are aware when new eggs hatch. Non-parents sometimes take a hand in feeding babies. While many exotic birds may be facing extinction in the wild, the clever Cockatiel's future amid humanity seems assured. Note: We are sorry to record that at the age of 12, Daisy finally passed away. She was found, eggbound, on her nest, with her mate, Rascal, sitting silently at her side. After the dead bird was removed, Rascal has continued calling for her 24 hours a day for weeks following her death. She will be missed by all.